This photo was taken on a family half-term break in late February 2014 at NGR SS0826697430. I got up early and escaped from Bluestone National Park Resort for a couple of hours to visit Skrinkle Haven and Church Doors Cove, two beaches that looked promising on the map and didn't disappoint. 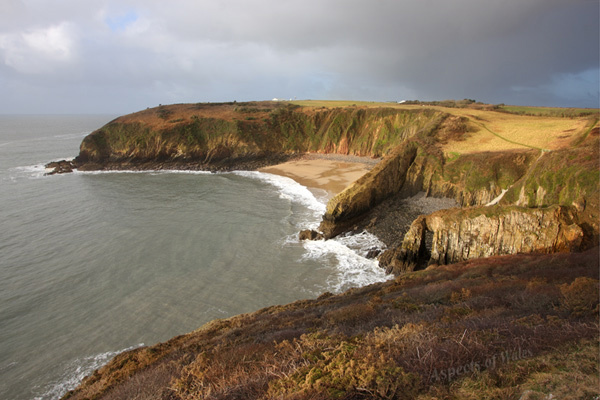 These beaches are on the South Pembrokeshire coast between Lydstep and Manorbier. Skrinkle Haven is the sandy beach on the far side and Church Doors Cove is on the near side of the thin headland, accessed via a metal staircase. They are joined at low tide and are also connected by a cave through the headland that separates them. There was a heavy hailstorm immediately after I took this photo, but luckily this viewpoint is only a few metres from the car park. Canon EOS 40D, Canon EF-S 10-22mm lens at 12mm, Manfrotto tripod. Exposure F11 at 1/40 secs. Original image in Raw format.